Like you, we are passionate about the well-being of animals; and we want pets and their owners to enjoy each other’s company and gain many benefits through their relationship. A key aspect of this is ensuring that any pet is healthy and happy; and our wide range of veterinary services, all delivered in-house when required, are a major part of that process. We work out of our purpose built, superbly equipped, modern vet hospital, family-owned and operated, and opened in August 2011. It’s situated at 31 Normanhurst Road – a very short walk from the train station – and open every day of the week. Here we provide an extensive range of professional pet care services. These are all delivered in-house, meaning a one-stop and easy-to-reach location for our many clients and their brilliant pets. These services include in-depth veterinary consultations and an extensive range of key medical treatments; including both digital radiography and ultrasound examinations, backed up by on-site and swift investigative pathology. Added to these are a further range of key clinic services such as dog behaviour consultations, keyhole desexings, and laser therapy treatments. We also offer a series of highly popular puppy preschool classes, plus an extensive selection of vet only pet food, pet care and grooming products, plus leads, halts, litter trays, cat carry cages and much more. We also undertake re-homing services for cats and kittens, visit local schools, and offer professional support to many local domestic and wildlife animal organisations. Then there’s our famous VetVan! We appreciate that it’s often not possible to come to our clinic, maybe due to family needs, time or work pressures, or perhaps your own health issues. This is why we offer many of our vet services at your location, thanks to our superbly equipped mobile VetVan. This service is available in both Hornsby District and Upper North Shore. Our four experienced and passionate vets are superbly supported by a group of seven highly qualified veterinary nurses as well as one very special and caring receptionist. One thing we all have in common, and you probably won’t be surprised about this, is that we are committed pet owners. Our joint collection includes several rescue cats and a bunch of dogs (many of whom like to visit our clinic to check out what’s happening) plus chickens, the occasional bunny (some of which are rescue bunnies and are waiting to be re-homed) and more. Many of our team also volunteer, or have worked at, superb organisations such as SASH (Small Animal Specialist Hospital), the RSPCA, the Cat Protection Society, and even in running a ferret rescue, and helping native wildlife. To find out more about us please give us a call on (02) 9489 6000 and chat with one of our caring and committed pet care team. We are also ready to cope with pet emergency situations. At at times when we are not open, we know it’s important to know where you can go. Click here for full details of our opening times and click here for these vital alternatives. 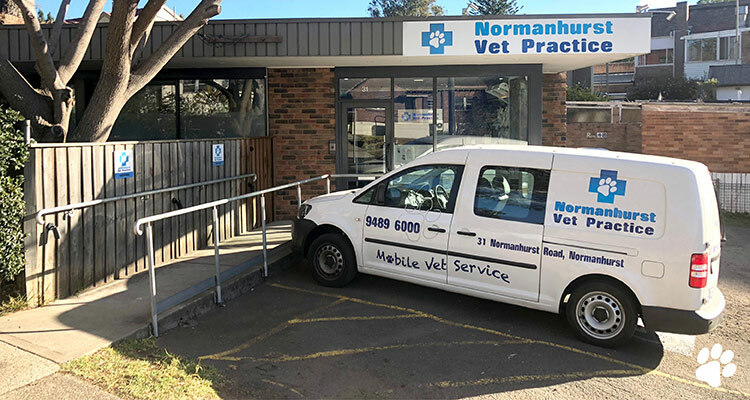 The Normanhurst team look forward to welcoming you and your pet to our clinic; both of you will be treated with professionalism, empathy and care at all times.